A Busy Winter for the Gentoo Penguins! 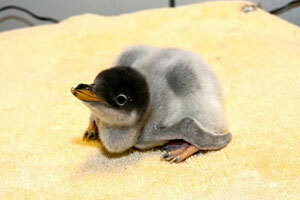 During this past winter, our Gentoo penguin population increased from seven to ten with the birth of three chicks. Since the Gentoos share an exhibit with nine rockhopper penguins, 19 penguins makes for a very, very playful and active exhibit! Gentoos grow to adult size quickly, so the chicks are no longer tiny and fuzzy, and now look full-grown. Gentoo penguins are extremely committed parents. In the wild, Mom and dad typically take turns sitting on and incubating the eggs while the other parent feeds at sea. Incubation can take up to 41 days. Wild Gentoo penguins live in the Antarctic Peninsula and surrounding islands. They can swim up to 22 miles per hour, stay below water up to seven minutes and dive to 655 feet. They are the third largest penguin species. Visit the Gentoo penguins daily, in the Herb and Nada Mahler Family Aviary.